The top two undefeated teams in the BCS rankings, Auburn and Oregon, will go head to head tonight, bringing unstoppable offenses in full force to the Tostitos BCS National Championship game tonight on DISH Network. The anticipated match-up of these two powerhouse teams brings a series of many "firsts" to tonight's BCS game airing live from Glendale, Arizona on ESPN at 8:30 PM ET. According to ESPN.com, this will be the first appearance in the BCS National Championship game for both the Auburn Tigers (No.1) and the Oregon Ducks (No.2); plus, this will also be the first time that two teams compete in the BCS game for the national title after not being included in the original AP top ten rankings (BCS title originated in 1998). The University of Oregon is also looking for its first BCS title and crystal trophy win, while Auburn hasn't had a national championship win in over 50 years, with its first championship title dating back to 1957. It's obvious that both teams have been unstoppable offensively, proven by their end of season perfect records: Oregon (12-0) and Auburn (13-0). 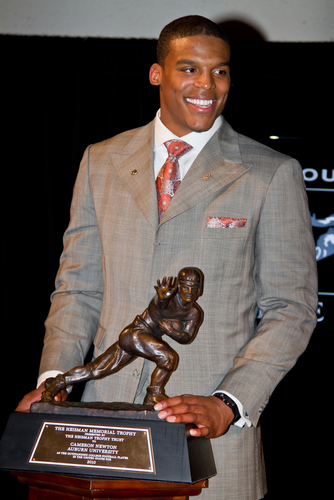 Auburn's Heisman winning quarterback, Cam Newton, will attempt to push his offense to another fast-playing, high-scoring game tonight, amid a current NCAA investigation. On the other side of the field, Newton and the Tigers will have to keep all eyes on Oregon tailback, LaMichael James, a key player offensively who leads the nation in rushing. Some other stats to keep in mind while predicting tonight's BCS champion includes Oregon's average of 49 points per game and 537.5 yards per game, with Auburn falling slightly short by averaging a total of 43 points per game and 498 yards per game. So who will it be? The Oregon Ducks or the Auburn Tigers? Find out tonight as you tune in to ESPN on DISH Network. Here's a look back at Oregon's 2010 college football season via ESPN on Youtube. Here's a look back at Auburn's 2010 college football season via ESPN on Youtube. Catch all of the most-watched sporting events in HD on DISH Network. Call us at 866-989-3474 or browse DISH Network NFL RedZone and other packages at Dish-Systems.com. You can also find the latest news in DISH Network programming and satellite TV deals by following DISH Systems on Twitter and Facebook.